So, you’re ready to install a new pool or hot tub in your backyard? At Varsity Pools & Patios, we understand that a swimming pool is just a part of the bigger picture that you call your home. Above and around the water is a living landscape. It’s a place where families come to cool off but to also find joy, exhilaration, tranquility and the pleasure of good company. A private paradise at your very own fingertips! 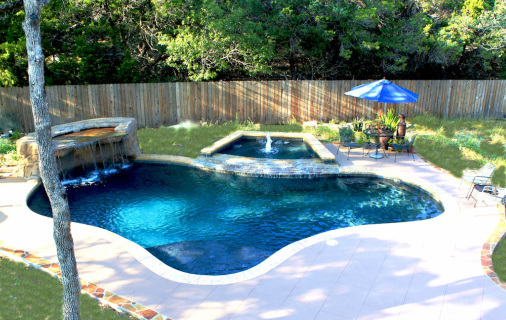 Varsity Pools creates complete backyard environments with custom pool designs as the centerpiece of your backyard oasis. We begin with the lives that our customers lead, then marry their vision with their needs and passions. Next, we design and build flexible, elegant swimming pools that bring their backyard paradise to life. Due to the South Central Texas climate, our customers routinely tell us that they never thought they’d be in their pool so much. However, with a dream vacation scenario in your own backyard, we understand the fact that you just can’t stay away! Varsity Pool customers live in the compact urban spaces and garden homes of Stone Oak and Alamo Heights to the sprawling acreage homes in New Braunfels and Boerne. Their homes are built on hills, on rocks and on everything in between. Just as no two families are alike, neither are their properties or their homes. Custom swimming pool designs are truly required. Each and every Varsity Pool environment is a unique, custom creation reflecting the spirit of the owner and the spirit of the outdoor oasis they have in mind. Varsity Pools has always provided our customers with uncompromised quality at the best possible value, and we continue to make this one of our chief goals. For us, quality means longevity, efficiency, performance, and craftsmanship running right alongside beauty. We do not aim to bring you an extravagant display of products that will break down in a short time or fail to bring you the high level of rest and rejuvenation that you desire. In our eyes, value includes both the purchase price and the cost of long-term maintenance for your pool and hot tub. We take great pride in building a long lasting relationship with each client and developing a sound investment to meet your lifestyle. From our first visit to your home to the last finishing touches, we use only the highest quality materials and the most contemporary construction techniques. We personally supervise each job and stand behind each pool to the fullest extent possible. There are few reputable companies that stand behind their work in such a strong way and raise the customer to the level of respect that they so deserve. Our customer service and integrity mixed with our talent and craftsmanship is what make our pool and hot tub designs the best. Call us today to learn more about how to get started in finally making your swimming pool dreams come true!